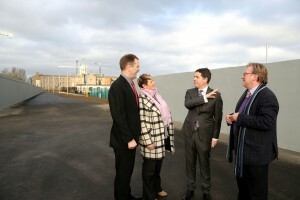 Pictured l-r: Mr Ger Casey CEO GDA, Ms Annette Murphy HSE, Minister Paschal Donohoe TD and Prof. Brian Norton President DIT. The Minister for Finance, Public Expenditure and Reform Paschal Donohoe TD officially opened the new link between Grangegorman and Constitution Hill this morning, Friday 16th November. This new link, while temporary, is historic, as it is the first time the Grangegorman site will link directly to the north inner city. It will be possible to walk from the campus to Bolton Street in 9 minutes. The Grangegorman Development Agency would like to thank the HSE, DIT, Dublin City Council, Dublin Bus, Bus Éireann, CIE, the National Transport Authority and Transport infrastructure Ireland for helping to make this happen.